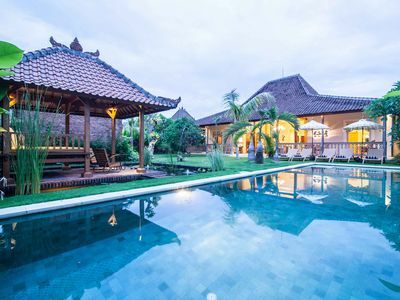 * subject to 15,5% tax, collected separately upon check in. 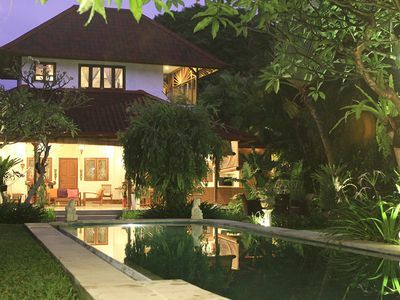 Applicable for 3 and 4 bedrooms option. Prices shown are for the 4 bedroom option. Contact us for pricing on 2 & 3 bedrooms. 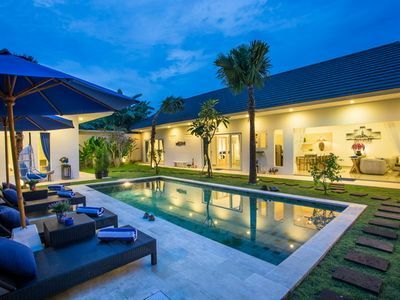 A 4 bedroom luxury villa surrounded by rice fields mixing tradition and modern art with a unique architecture, up to date equipment and high quality of service. 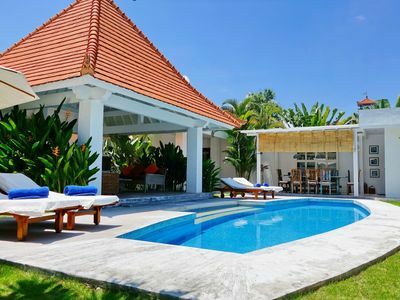 The Villa is located in Canggu, 7 minutes away from the famous Echo beach. 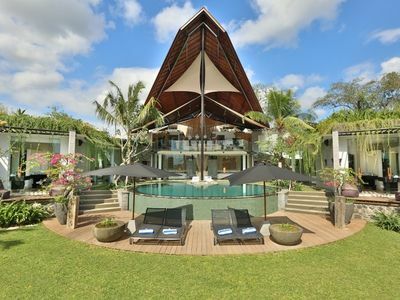 Stepping down to the garden we access to the four bedrooms with glass walls facing the garden and the pool for a great panoramic view. Three bedrooms offer king size beds and one bedroom has a double bed. 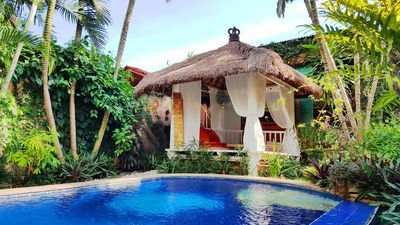 Air-conditioning, blackout curtain, satellite flat screen TV, IPod dock, dressing area, en-suite bathrooms with shower and bathtub are standard for each bedroom at the Villa. 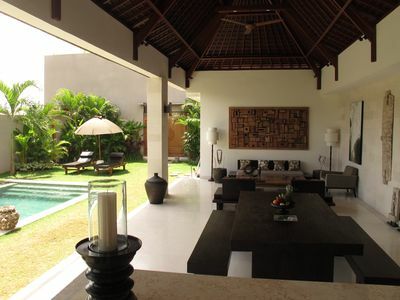 The two bedrooms have size 50 m2 and another two are 39.95 m2 and 48.39 m2. All the bedrooms are nicely decorated with special light features. 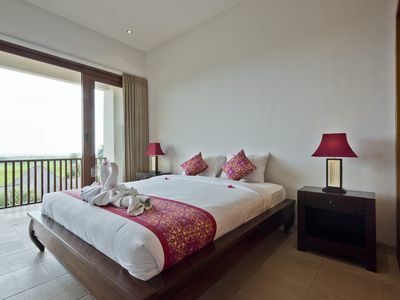 A fifth room has been design and fully equipped as a media room and provide also an Xbox 360 with lots of game choice. 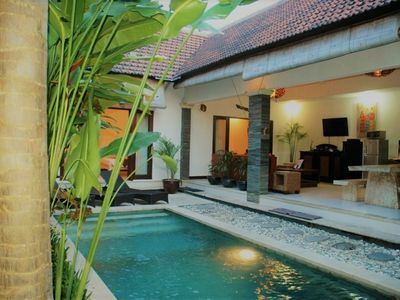 This room can be converted into a bedroom and has its own attached bathroom with open air shower. 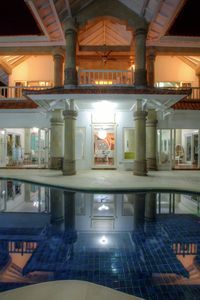 The 80m2 infinite swimming pool has a unique round shape with an incorporated whirlpool. 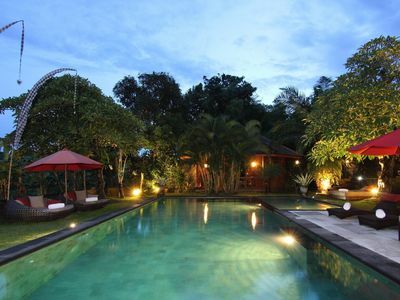 The garden is manicured with grass lawn and different type of tropical trees, plants and flowers. 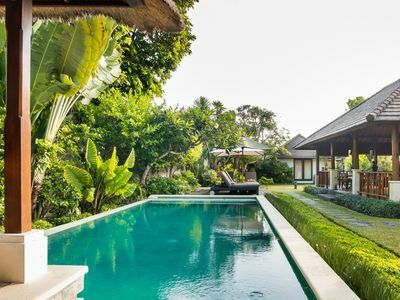 The garden and swimming pool arefacing directly to rice fields that have beautiful landscapes all the time. The car park has enough space for 3 cars. 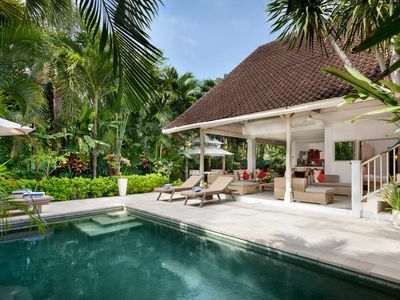 Villa is located in Canggu, 7 minutes away from the famous Echo beach. 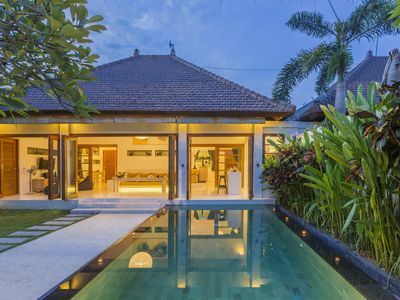 Situated at the edge of a traditional Balinese village with a peaceful environment, the Villa gives you the true Balinese experience with a direct view on the rice field that can be illuminated at night. 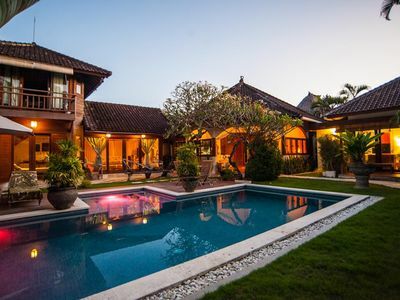 The villa is situated 35 minutes from the airport, 15 minutes from Seminyak the famous shopping and entertainment area, and 15 minutes from Nirwana one of the best Golf course in Asia. Please state in your inquiry if you'd require airport transfers. 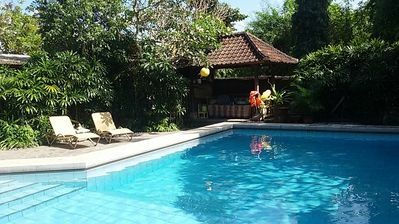 There's a transfer fee of IDR 250K one way for one car, to fit 4 people and luggage. Fee payable to driver directly. Surcharge of IDR 50K if the transfer is between 10 PM - 7AM. 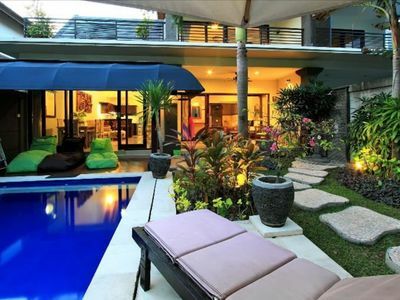 All rates are subject to 15.5% of Government Taxes and Services Charge. 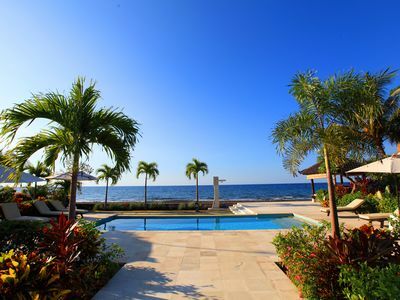 Please note that HomeAway payments don't include taxes & services, all taxes are collected upon arrival.